What are UFIs? They are Unique Fashion Identifiers, statement pieces that are eye-catching and say a lot about your personality. You can have as many statement pieces as you like. 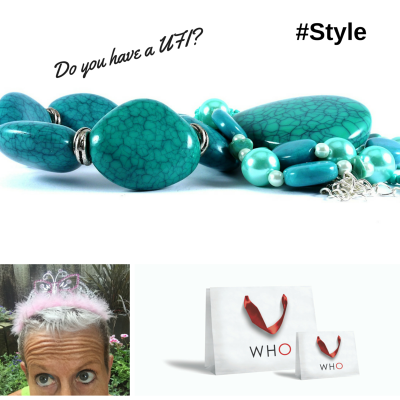 Your UFIs can be clothing or accessories, let’s look at accessories first, as these can be the most versatile and often eye-catching statement pieces. If you are not really a jewellery person try this exercise with other accessories. Or if this doesn’t work think about your clothes. When you are marketing yourself or your business, your statement pieces can also be a great way for others to remember you. Particularly if you starting out in business and are doing a lot of networking. You may find that because others are keen to build their own business, they find it difficult to remember your name, but will remember something visual. If you wear something eye-catching this association may act as a trigger! To give you an example, a couple of years ago I started carrying a very distinctive furry handbag. My rationale was that they may not remember my name, but they were unlikely to forget the handbag! Your UFIs can also be the way you style your hair or the make up you choose. Perhaps you always have your hair in a blonde bob? Maybe you always wear red lipstick. Audrey Hepburn used her hair and distinctive make up style to create her signature look. Her clothing styles were extremely varied, but she did maintain a gamin chic look throughout her wardrobe. Your statement pieces all have one important thing in common. They make you feel fantastic and confident every time you wear them. 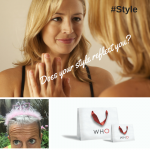 Does Your Style Reflect You? Do You Have A Grumpy Jumper?